NBC Entertainment co-chairmen George Cheeks and Paul Telegdy have said that the business’s planned streaming service will require a “reinvention” of windowing that will affect its content strategy going forward. The newly appointed co-chairmen, who have been in the roles for four months following the exit of Bob Greenblatt, told NATPE Miami delegates that NBC has been “very thoughtful” in how it enters the OTT space, and will mimic the Hulu model of serving as both an AVOD and SVOD proposition. “We believe Netflix-chasing is not a strategy, so we feel excited and bullish about where this is headed,” said Cheeks, noting that there “isn’t a one-size-fits-all strategy”. NBCUniversal revealed last week that a new OTT platform is to be made available to subscribers of NBCUniversal parent group Comcast, as well as European pay-TV operator Sky, which was acquired last year. The ad-supported, free service, which will reach around 52m subscribers in total, is to feature original content as well as third-party programming. Meanwhile, an ad-free version of the service, that will be priced competitively, is also in the works, while non-Comcast or Sky subscribers will be given the chance to sign up to the service separately. “One possibility is you take all your originals and all your licenses – once the cycle is off – and put them all in one ecosystem,” said Cheeks, assuring that the NBCU service will be a “bit more nuanced and bespoke”. 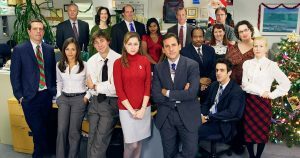 On the back of controversial deals such as Netflix and WarnerMedia’s Friends renewal, there has been widespread speculation around what might happen to The Office, which is one of Netflix’s top shows but is set to expire in 2021, leaving NBCU to decide whether the content might live on its fledgling platform or Netflix. Cheeks noted that seeing The Office in Netflix’s top show rankings is “gratifying”. Netflix’s VP of acquisitions Amy Reinhard told TBI earlier this week that the platform would “absolutely be in those negotiations” for the show. Asked how NBCU is looking to keep up with cash-flush SVODs and their major talent deals, Telegdy appeared bullish, noting that “people can talk to producers who have had long-term, repeat business with us as studio and rights exploitation business, and [they will say] it’s a partnership. One recent talent partner is singer Kelly Clarkson, who fronts a new syndicated daytime talkshow for NBCU called The Kelly Clarkson Show. The star was in town in Miami on Tuesday (22 January) evening, performing at an intimate venue for various buyers. “It’s a really hard job because of the number of episodes required,” explained Telegdy.